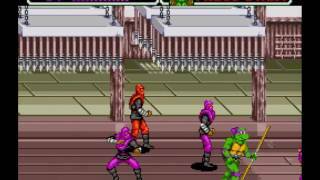 Play Teenage Mutant Ninja Turtles - The Hyperstone Heist online with Sega Genesis browser emulation for free! 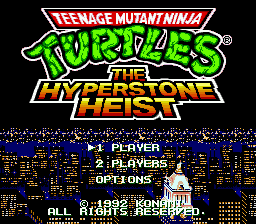 Teenage Mutant Ninja Turtles - The Hyperstone Heist (GEN) game rom is loaded with features in our flash, java and rgr plugin emulators. Nothing to configure, we've done it for you! Mikey farted in the elevator, didn't he...? So the Shrinking New York thing was a fake??? 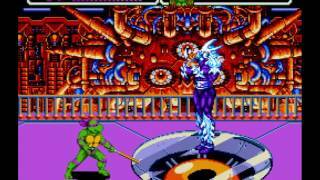 Greetings Ladies and Gentlemen and welcome to the finale of TMNT Month 2! 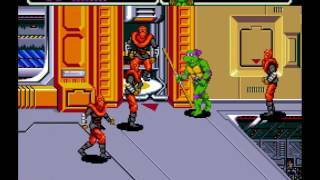 Today, we'll be looking at Teenage Mutant Ninja Turtles: The Hyperstone Heist for the Sega Genesis. With the massive success of Turtles in Time, I guess Sega wanted a share and asked Konami to develop a Turtles game for the Genesis. What we got was a "semi-port" of Turtles in Time. I say "semi" because while it has vast similarities to that game, it's also very different. How? Let's find out. 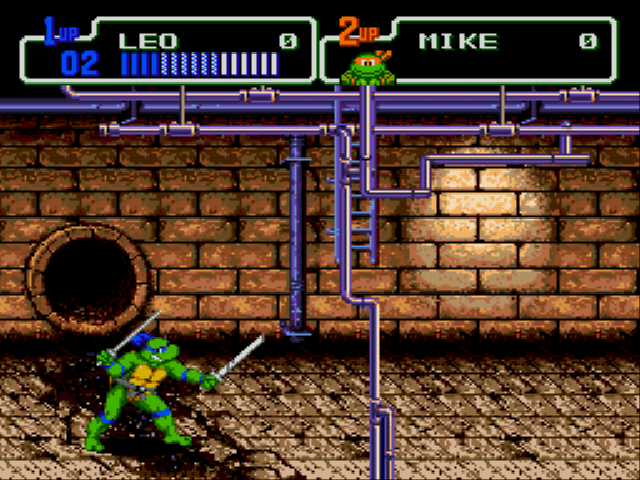 The graphics here are very similar to Turtles in Time in that the sprites are about the same. They are slightly downgraded, but then again, the Genesis wasn't as good with graphics as the SNES, or at least most of the time. However, what I find odd is that the animations appear to be slightly better in this game. It could just be my eyes playing tricks on me, but I swear the animations here are closer to the arcade game than the SNES version. For a Genesis game, this looks great, especially considering they had to create some sprites from scratch because of levels exclusive to this game. The soundtrack here is mostly the same as the SNES/Arcade soundtrack except with additional tracks for exclusive levels and they've also been re-instrumented for the Genesis. The sound quality is a little bit of a downgrade from the SNES, but that's to be expected. The music still sounds great though, so that's a bonus. However, the sound effects took a huge fall. Not only the sound effects for hitting people, but also the occasional voices like when they say "Cowabunga" or "Shell Shock". It can get grating at times and, at others, just plain awful. The sound effects are really just a nit-pick though, and they don't detract too much from the experience. 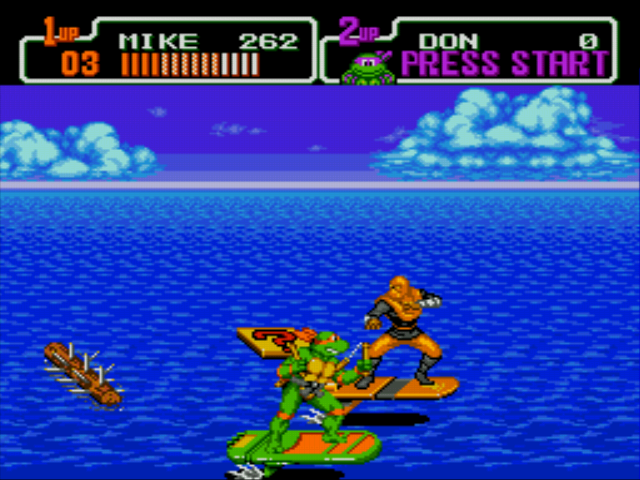 If the Genesis is the only way you have to play a Turtles game, you'll probably be coming back to this quite often. But if you have a SNES, as well as Turtles in Time, you probably won't. It's really just a matter of what you have available to you. Basically, unless you don't have access to the other two versions of the game, you probably won't be playing this too much. While this game may be a clone of Turtles in Time, it's plot is actually very different. Instead of stealing the Statue of Liberty, Shredder decides to use the Hyperstone, the treasure of Dimension X, to shrink all of Manhattan Island. 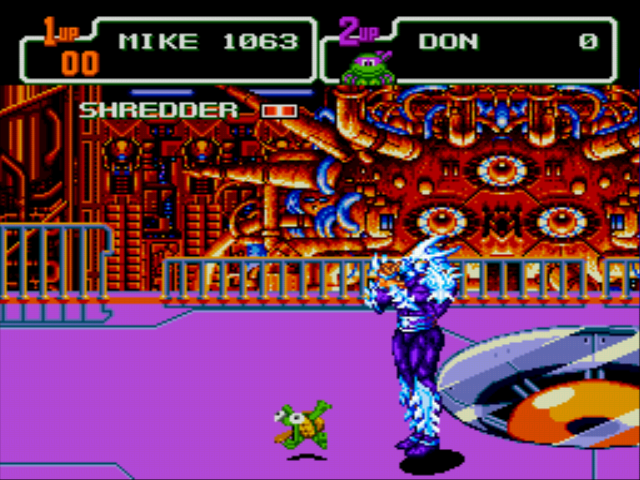 The Turtles, of course, won't stand for this, and decide to deal with Shredder...again. This plot is clearly more based on the 80's cartoon series, due to the mention of Dimension X. Like most old-school games or just beat-em-ups in general, it's not much of a plot, but it's enough for you to know why you're doing what you're doing. 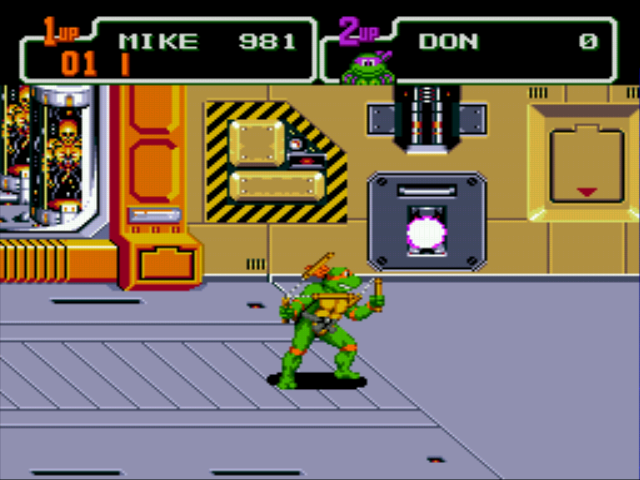 This game is actually a little bit shorter in length than Turtles in Time, but it almost feels as long due to the fact that, while there are only 5 levels, each level is divided into 3 sections and end with a boss. Basically, it's like Sonic 1, only with 5 Zones instead of 7 or 8. 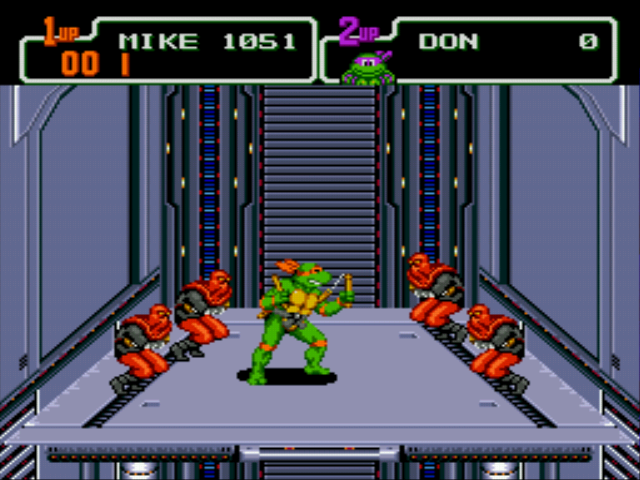 Considering there are fewer levels, in terms of numbers, than Turtles in Time, Konami had to make exclusive sections of levels in order to lengthen the game. 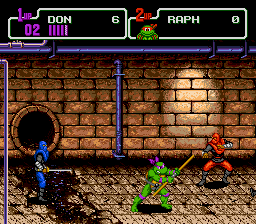 The enemies are just as varied as Turtles in Time, but appear to be faster. The only reason I'm including this section in this review is because there have been changes to the difficulty to make it slightly harder and worth mentioning. With the Genesis' faster processor, game speed has been slightly increased, making some sections more difficult due to faster and more aggressive AI. I found myself dying to Leather Head more times here than the SNES or arcade versions. I also found myself dying more in general. Now, another thing that may attribute to the rising difficulty is the fact that the maximum amount of lives you can have has been decreased from 7 to 5. I know it seems like a small thing, but it really does feel like it's adding some difficulty to the game. This game actually controls a little differently than the SNES version, though this could also be due to the fact that the two systems have very different controllers. You can set the buttons to whatever you'd like them to be in the options menu. The D-pad is used to move, and the Start button is used to pause. The defaults for the lettered buttons are A to attack, B to jump, and C to dash. Yes, dashing has been given it's own button. It's actually a very welcome change, considering tapping in the same direction twice sometimes doesn't respond like it should. It controls pretty nicely, and with faster movement and better, more fluid animation, it feels more similar to the arcade game. Overall, this is a very good Turtles game that is very often over-looked, due to it's SNES counterpart being a slightly better/more popular game. If you're a Turtles fan and you have a Genesis, this is definitely one game you should add to your collection. With good graphics, good music, and great gameplay, I give this game an 8.75 out of 10. 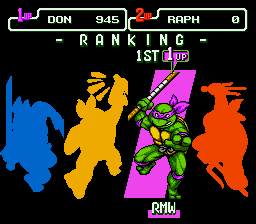 (Rounded up to 8.8 on Vizzed) Well, that concludes TMNT Month 2. Join me next month for Super Mario Month, where I'm finally going to tackle the old-school Mario games. Until then, peace out! 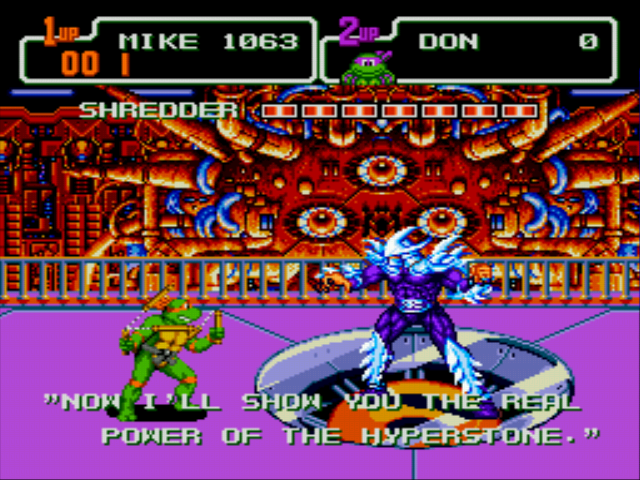 The Turtles' nemesis Shredder has acquired the HyperStone from Dimension X, and is using its powers to shrink down the city buildings. 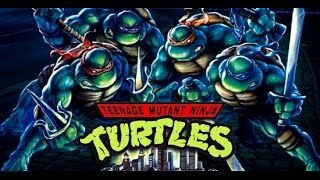 He threatens to take over the world and challenges the Turtles to deny him, and so the turtles head out to beat the guy once more.A standard Ninja Turtles beat-em-up action game. For some reason, playing this version feels like a lot more work than the SNES version. 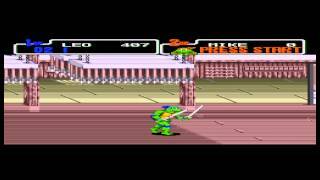 another good TMNT beat'em up. better when playing on 2-player. This games awesome! I still prefer the SNES version a little better but this is still great! i can't see anything on my screen but the sounds is there anyone know what to do ? Meh. It's ok, but nowhere NEAR as good as Turtles in Time. This is The Return Of Shredder! !